The creation of supplier invoices is the final step of procurement: it is the step that is going to produce the accounting lines in the purchases log. In the case of buying simply, without supplier or delivery (telephone subscription for example), the more simple is to use the form for quick purchases. For purchases, use the command sequence > delivery; it is sufficient to transform the order in initial supplier invoice. 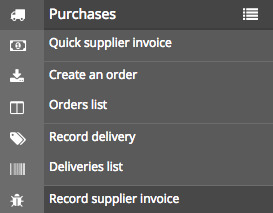 You can also, of course, save directly from a supplier invoice in the Purchases menu. How do I use live margins? How do I link an expense to a sales invoice? How do I calculate margins with catalog items? How do I add internal costs to margins?